Unfortunately, your registration has been declined by the auctioneer. You can contact the auctioneer on 843-337-8553 for more information. You are the current highest bidder! To be sure to win, come back on Nov 16, 2017 11:03 EST (16:03 GMT) Date Format as the lot closes or increase your max bid. 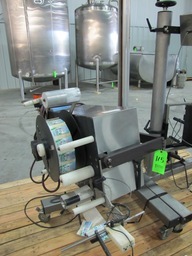 For Auction Industries delivery information please telephone 843-337-8553. 1. IDENTIFICATION. All purchasers are required to give full name and address. auction sale, or by approved prior written arrangement with the Auctioneer. for most items is free as the equipment is pre-skid and ready for shipment. removed within the time aforesaid. representatives of the Auctioneer at the plant unless otherwise announced. the time fixed and before removal of any of the goods. lost, stolen, damaged or destroyed from any cause whatsoever. 8. CLAIMS. No claims will be allowed after removal of goods from premises. the value against which all claims for loss or damage shall lie. will be charged to the defaulting purchaser. condition of the premises on which the sale is held. one or more selling lots or to subdivide into two or more selling lots. the right to sell all the property listed, in bulk. for such excess, at the rate of purchase. on behalf of the seller. be taken as final in the event of any dispute. to confirmation of the Court, as announced. the acts of its principals. announced prior to the auction.